Visual Memory by a baseball batter important to hitting when changing climates, temperatures, humidity levels, or altitude. As a hitter, a player remembers the track the ball took from the pitcher's finger release point to the plate. Practice, practice, practice. . . . A hitter is forming his visual memory of the ball in flight, and while practicing and playing, he sets his muscle memory in order to connect with the ball. At each level from little league through the big leagues, the hitter must quickly correlate his visual memory to his muscle memory so that his hand-eye coordination allows him to be successful. For additional information on visual memory, go to the Air Force Academy's training Web site on that subject by Clicking Here. 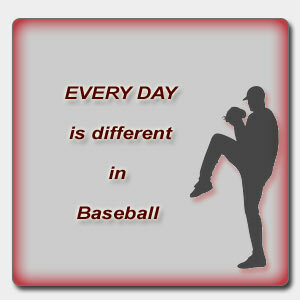 This is why it is difficult for a good baseball player to transition to hitting the fastpitch rise-ball. If he has no visual memory of hitting such a pitch, then his muscle memory is not coordinated with his visual; therefore, his hand-eye coordination cannot allow him success. In different temperatures, similar pitches will take a different track. 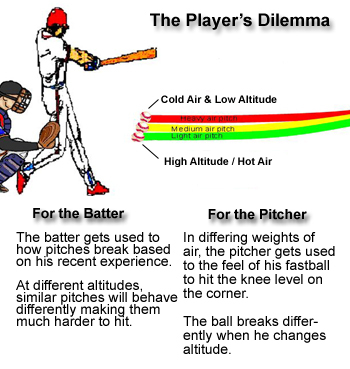 At different altitudes, similar pitches will behave differently as well. Once a player’s visual memory conforms to the amount of movement provided by a particular climate, he begins to see the pitch more clearly. His muscle memory matches his visual memory, so he is more effective as a hitter. His anticipation of the track a pitch takes matches the memory of his recent experience. The four-seam fastball in the 90+ mph range is the most difficult to track because of both the speed and the lift the air allows on the ball. The ball breaks too late to make an adjustment in one at-bat. The visual memory must be intact from previous repetition. The primary reason a low outside four-seam fastball (rhp to rhb or lhp to lhb) is toughest to adjust to, is that the ball breaks toward the hitter's eye, so he cannot see why he missed, unless he fouls it off. When this player changes climates (sometimes dramatically), it will take him several games to adjust his visual memory to match his muscle memory. Even though he has been in this situation previously, his recent memory of the track the baseball takes to the plate trumps his distant memory. If the change is dramatic, it will probably take him more time. If the change is only slight, he and any observers may not notice much of an adjustment at all.